Clearly Compact & Designed to Impress The Crystal Series 280X RGB is an ultra-performance Micro-ATX case, with three tempered glass panels that display your system and two included LL120 RGB fans with 32 RGB LEDs controlled by CORSAIR iCUE software. You can create amazing lighting effects or synchronize all your Corsair RGB lighting together. With exceptional cooling options there’s room for up to six cooling fans and multiple 240mm liquid cooling radiators, while the dual-chamber design lets you tidy drives, cables and the PSU for cleaner builds in a dedicated compartment. Versatile Cooling OptionsInside the Crystal Series 280X Micro ATX case there's room for up to six 120mm cooling fans, or a 240mm radiator in the roof, 240mm radiator in the front, and 240mm radiator in the floor. Efficient PerformanceWith the Direct Airflow™ Path, cool air is directed to the hottest components without any interference from drive cages. keep your system clean The Crystal 280X features a dedicated storage compartment for up to two 3.5” drives and three 2.5” drives and keeps your system clean without sacrificing storage capacity. x2 Corsair LL120 RGB Fans included The Crystal White 280X case includes two Corsair LL120 RGB fans, which boast 32 individually customizable LEDs, powered by an included Lighting Node PRO digital RGB lighting controller and CORSAIR iCUE software. Choose your favourite style by switching through various profiles, to deliver an array of eye-catching illumination. Three Panel Display The Crystal White 280X allows you to display your system unlike any other case, with three stunning tempered glass panels you can enjoy immersive RGB lighting. Easier & Tidier Builds Highlight your PC’s core components whilst tidying cables, drives and the PSU into a dedicated rear chamber. keep your system in pristine conditionThe Crystal Series 280X features front, roof, floor and PSU dust filters that help to preserve your build long after your PC is finished and keeps it looking impressive. 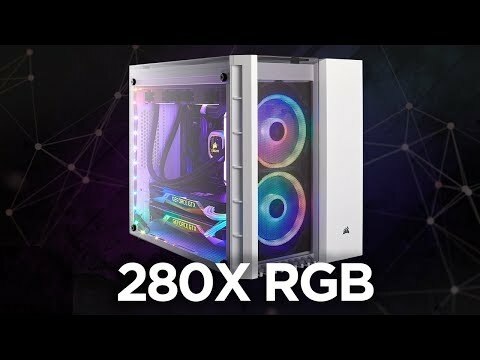 Corsair Crystal 280X RGB White MicroATX PC Case w/ Tempered Glass Window, MicroATX/Mini-ITX, 2x120mm Light Loop RGB Fans is rated 5.0 out of 5 by 1. Rated 5 out of 5 by Rahhhul from Looks incredible! Previously I had the Corsair Air 540 case which is the ATX version. As I'm only running one GPU and felt there was a lot of empty space within the case I decided to upgrade to the 280x and it looks amazing. Converting from an ATX to a M-ATX means you have to be a bit more wary in terms of room but this case design allows you to keep all of the wires on one side and all of the good stuff on the other. Buying into Corsair's RGB family can really make your whole rig look great and when you have everything synced up thanks to the lighting node which is provided with the case, it looks like a word of art. Some people have said that air flow isn't the best due to the tempered glass on the front and top however I've found there to be decent airflow with all my parts remaining at manageable temperatures. Will this accomodate an EVGA 2080ti FTW3? It's a massive graphics card and i have to leave the side panel off my Corsair Carbide 240 to accommodate the power connectors. that card is slightly too long to fit in the case in question, i reccomend instead something like the 275r or the h500 from nzxt.